The Atibal AT-MCRD Pro is Atibals newest version of their MCRD Micro Red Dot and more affordable. This new model is just as tough and reliable as the original it just doesn't have all the bells and whistles. The AT-MCRD Pro has 11 brightness settings and a molded non-removable base. Any pics mounted on ar pistol platform? does scope have mounting device? BEST ANSWER: The MCRD Pro has a molded bottom that is not detachable. What mount do I need for mounting it on my PSA M14.....??!! How does this co-witness with AK sights / shotgun ghost ring sights? I'm thinking about mounting one on a Mossberg 590A1. Thanks! Will this mount to your standard picatinny rail? does this fit gen 2 from palmetto in 308? BEST ANSWER: If it has a rail on it, it will. Will this sight attach to the top of a AR 15 carry handle? My first build and I love it. Love this red dot! Mounted it on my 300BLK, had it popping targets perfectly at 100 yards easy! The price is what makes this little guy so awesome. Clarity is good. Bright, clear, rugged, and affordable. As good as red dots that cost twice as much. Recently put one of these on my AK. Durable, clear glass, holds zero, and great battery life. Really love the fact that it takes standard AAA batteries. If your debating purchasing you won't regret it. Great product and a great value. You’re not going to find a more quality product for less. Atibal does it right. Worked great on my SBR, couldn't as for more out of as sight in this price range. Recently put one of these on my ArmaLite M15 LTC and I'm very impressed. Put about 400 rounds through the rifle with the red attached and the zero is still perfect. This is my 2nd MCRD Pro, best red dot for the price. Extremely bright, takes a common AAA battery, has very positive click adjustments and looks great on my CZ Scorpion. This is my new go to for red dots. I personally do not own one of you optics but I’ve shot plenty of rifles of buddies with your optics I’ve been thinking about getting one of your products for a while now. Your red dots are great and your scopes are crystal clear. Outstanding value with these. Really good optic and an even better price! These red dots are awesome! I have one of these on one of my ak47's and it is rock solid. 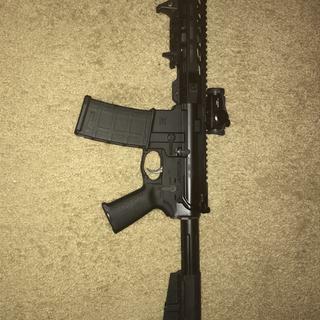 I was so impressed with this optic I bought a similar Atibal red dot for one of my AR15's and I am equally impressed. Atibal has become my go to for optics, and will be buying more from Atibal in the future. I highly reccomend Atibal optics. You won't be disappointed! This is a great red dot out performs those costing 2-3 times as much! !